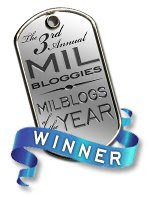 Just a reminder that the MilBloggies are approaching and I need your votes. 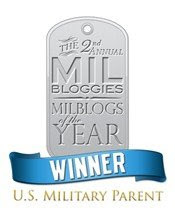 If you haven’t registered and voted for my blog yet, go HERE, register for FREE and add this site to your favorites (not into your browser, just on the site). It’s free and doesn’t require signing up for anything or giving money or credit info or watching pop up ads... You just type in your email address and a password... they send you a confirming email... it's that simple. So I'm asking you to go on the site, register, then activate your registration when they send you the email... Search for "SOLDIER'S MOM" and hit the little button that says "Add to Favorites". Fingers crossed & good luck, SSM!! I voted for you the other day. I don't know if you saw this, but your blog is listed twice, one just slightly different from the other and both have votes. You might want to get them to combine the two, if you haven't already.